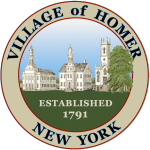 There are two public parking lots in the Village of Homer. One is located behind the Homer IGA store, and the other is located by Heritage Realty. There is no parking in these lots from 2:00am – 6:00am. Prohibited parking is posted with clearly understandable signs throughout the Village. There is no parking on any of the streets of the Village or in Village parking lots between the hours of 2:00am – 6:00am. Parking violation fines are $25. If not paid within 10 days, the fine increases to $50. Handicap parking violation fines are $75. If not paid within 10 days, the fine increases to $150. No person shall drive a vehicle at a speed in excess of 20 miles per hour in the marked School Zones during school days between the hours of 7:00am and 6:00pm. Central Park Place (the road that leads into the Elementary School from Main Street and exits behind the Homer United Methodist Church at Cayuga Street) is a one-way street. Entrance to the church parking lot from Cayuga Street is not permitted. Through traffic is prohibited on Central Park Place between the hours of 8:00am – 9:00am and between the hours of 2:30pm – 3:30pm on school days, with the exception of school buses only. Through traffic is prohibited on Hudson Street from Clinton Street to West Street (Route 281) between the hours of 7:00am – 9:00am and between the hours of 2:00pm – 4:00pm on school days. Through traffic is prohibited on Nixon Avenue between the hours of 7:00am – 3:00pm when school is in session. Crossing guards are located at the Route 281 and Bedford Street intersection, Clinton Street and Intermediate School intersection, and Main Street and Central Park Place intersection during the hours of 8:00am – 9:00am and 2:30pm – 3:30pm. Please be aware that they may be stopping traffic or in the roadway during these hours.